I, the author of this piece, used to work with ApolloCurrency for a brief period of time in 2018. During that time, I got to take an in-depth look at the team, talk with Steve McCulloh (project leader) directly on countless occasions and liaise with him on quite a few tasks. Ultimately, I announced my departure from the team in July 2018, due to a disagreement over the best way to proceed forward. I objected strongly to their inclusion of John McAfee in their marketing strategy for personal, business, and moral reasons. For the record, the relationship ended amicably. However, I have no ties to ApolloCurrency at all. I do not own any ApolloCurrency and I have no stake in the project’s success or failure. I would not consider myself to be ‘close friends’ with any member of the project’s team either. So readers should not consider this article to be an unjustified ‘defense’. Given my in-depth knowledge of the protocol, I figured that I would be one of the best, objective sources to give a better perspective on what is going on with the Apollo Team and whether they’re ‘legitimate’ or not. This article was neither paid for or requested by the ApolloCurrency team. As stated above, I have absolutely nothing at stake in this situation and the community’s opinion of ApolloCurrency has absolutely zero impact on me. I am simply a fan of the truth — whether it be positive or negative. 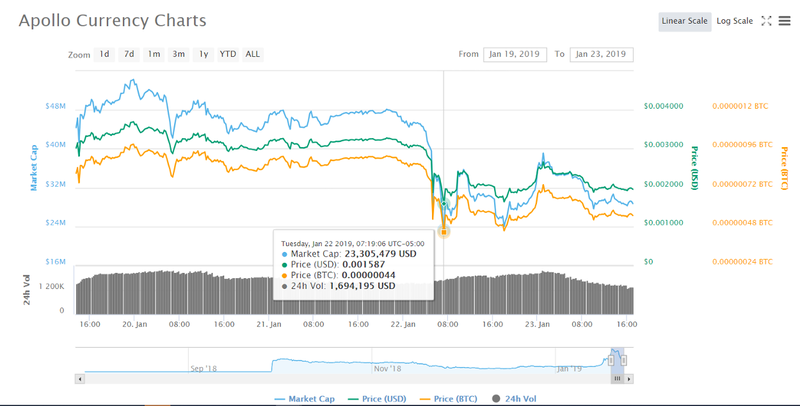 As stated in the title of the post, the user alleges, “The Apollo Currency Team (APL) just engaged in a massive pump and dump scheme, dumping hundreds of millions of coins on their investors”. 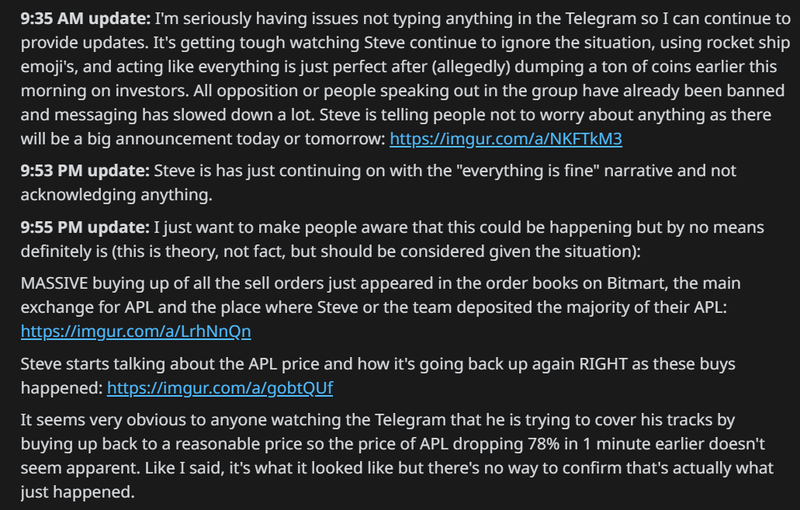 The author of the Reddit post then states that their concerns arose when they saw multiple sell orders for $APL on various cryptocurrency exchanges. After seeing this, the author states that they then went to Apollo’s block explorer. In order to assess the veracity of these claims (which are serious), we must first look at each piece of evidence provided by the Reddit user. In the picture above, we can see that the price for $APL was $0.003695 and 99 sats, respectively. At its lowest point (in the last 24–48 hours), $APL hit a price of $0.001587 and 44 sats, respectively. These two totals represent a depreciation of -57% in USD and -55% in $BTC value. 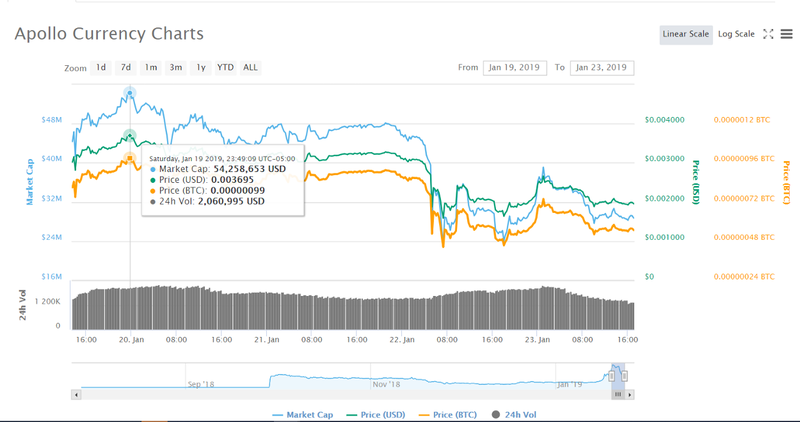 These totals are a bit different than what the author stated in their original post, but the difference in the two totals could be attributable to the user seeing price data on the exchanges that is more ‘minute’ or ‘immediate’ than what is shown in the Coinmarketcap historical price review. While this shows a decent decline in the price of $APL, this, by itself, does not demonstrate or prove that the developers have emptied their coffers entirely as the Reddit user suggests. So let’s look at the other evidence given in the Reddit post. As you may recall, the original Reddit post contained a link to four different wallets that allegedly belong to developers or members of the Apollo Currency Team. The above screenshot contains the links to the wallets where the developers/project leaders allegedly dumped from. So let’s examine them to verify this claim. 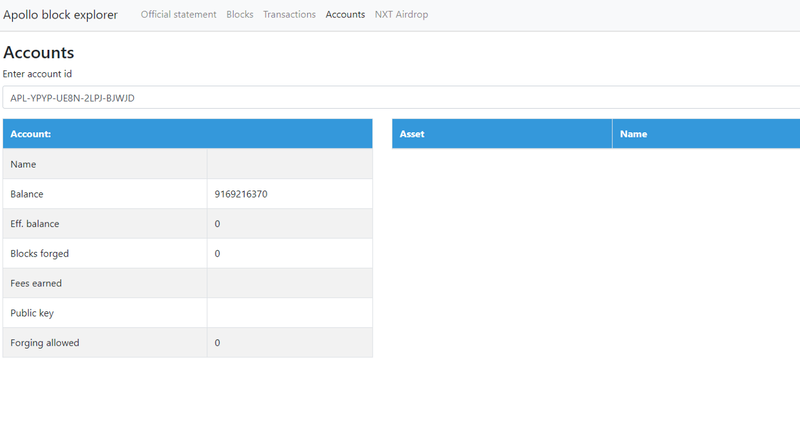 According to the block explorer for Apollo, the wallet contains a current balance of 984,862,745 $APL (Apollo coins). This amounts to 984 million Apollo coins. Currently, there are 14.6 billion $APL tokens in circulation at the moment (the rest must be minted/mined). Thus, this one wallet still possesses 6.7% of all $APL in circulation at the time of writing. The total value of this wallet (in USD) is $1.9 million. It seems illogical for the Apollo team to leave approximately $2 million in one of their wallets if they are truly planning an ‘exit scam’ on investors. This is also a major sign that the developers did not actually dump their holdings on investors. Let’s take a look at the next link. According to the Apollo block explorer data at the time of writing, this wallet contains 241,487,396.9422 $APL tokens. To simplify that, there are approximately 241 million $APL tokens in this wallet. This totals to approximately 1.6% of all of the circulating $APL at the time of writing, which is substantial. In USD value, this wallet holds approximately $473,798.27 based on Apollo’s value at the time of writing. Again, it doesn’t seem logical for the team to leave half a million dollars worth of their token in this wallet if they were truly dumping their entire supply on the markets before exiting. The total balance of this wallet is 102,034,310.5384982 $APL. To simplify that number, the wallet holds approximately 102 million $APL tokens. This represents approximately .7% of all outstanding $APL tokens at the time of writing. The total USD value of this wallet is approximately $200k ($200,191.32). Once again, this is yet another wallet address that contains a significant sum of money remaining in it after the alleged ‘dump’. 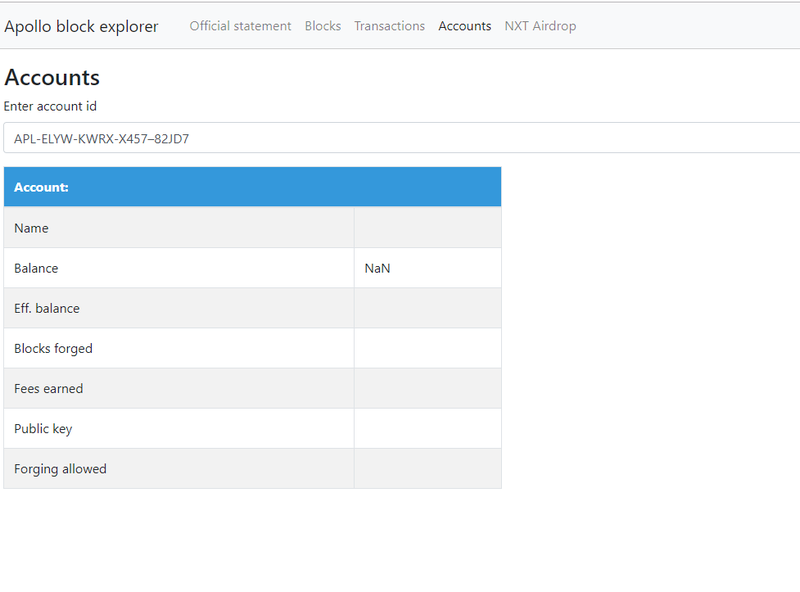 According to the block explorer, this wallet currently holds 13,000,954.11 $APL. This represents an insignificant amount of $APL (in comparison to the total circulating supply). The USD value of this wallet is $25,507.87 at the time of writing. We can’t really make any interpretations about this wallet without seeing a link to any outgoing/incoming transactions from any of these wallets that were listed. Since this is such a hot-button topic, I wanted to get down to the bottom of what is going on with the Apollo protocol. As stated in the introduction of this piece, my only interest is in ensuring that the truth is brought to light. Therefore, I did take some time to consult the ‘other side’ by reaching out to project leader, Steve McCullah. After reading the Reddit post and doing a bit of investigatory work myself, I contacted Steve McCullah directly to ask for his feedback on the Reddit post. Specifically, I asked Steve McCullah if he could provide the addresses of the team’s official wallets and speak on how many coins they initially received. A) When $APL was created (it is a pre-mine; this is public information not in dispute), the founders and the Apollo Foundation were given 6 billion $APL coins collectively. B) “We still have over 5.5 billion of that in our wallets which have been made public over and over. Not a single APL was ever sent to any exchange. Following this point in the conversation, Steve McCullah then provided the addresses for the 4 wallets which the funds were split into. “Yes, we had it listed and then we ended up taking it out of the whitepaper because it was completely outdated at that point. People kept getting it confused as the current allocation. Given Steve McCullah’s response, it would be fair to criticize the team for not being transparent enough about the wallet addresses that the team owns. I noted to him in the conversation that the permanent, public revelation of these wallet addresses probably would have prevented any confusion or potentially false allegations from cropping up. Anyone that has read my work knows that I am a stickler for transparency in the crypto space, and this instance is no different. The team did themselves a disservice by not making this information publicly known and I urged them to do so in the future for their own sake as well as that of the greater crypto community. As noted in the previous section, Steve McCullah provided four wallet addresses that the Foundation money was disbursed to (after receiving 6 billion $APL). As good stewards of the community, we can never simply accept the word of any individual. We must verify it independently ourselves (isn’t that the purpose of blockchain? Trustlessness?). The verification steps will be posted below for any and all readers that are interested in verifying this process for themselves as well. All that is needed at this point is to copy the wallet addresses posted above in this subheading (one by one), and then posting them into the text field on the ‘Accounts’ page. We’ll look at the results in the next section. 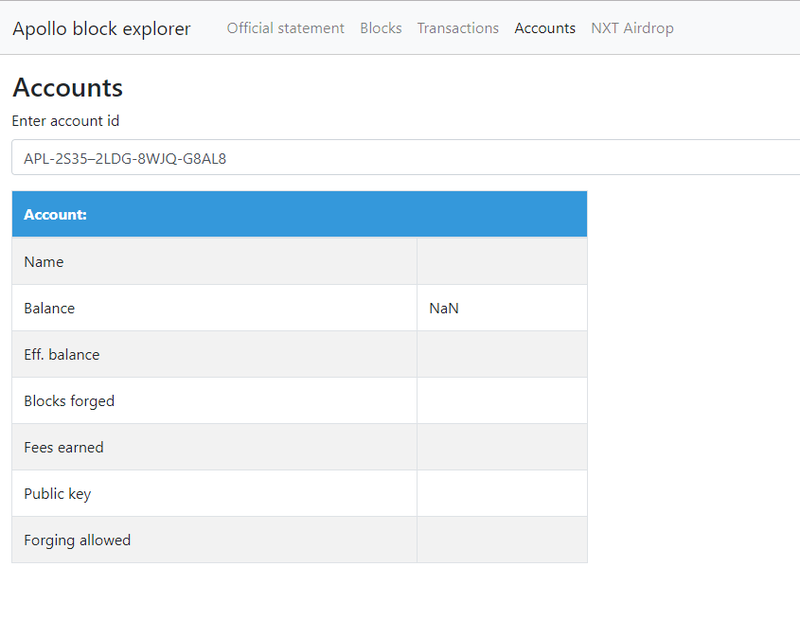 For some reason, the third and fourth addresses that were given did not yield any results in the block explorer. The ‘NaN’ is the same result one would get if they typed random letters into the explorer. So, it remains to be seen whether this is a typo or some sort of alternative error. The first and second wallet addresses, however, did contain a significant amount of $APL. 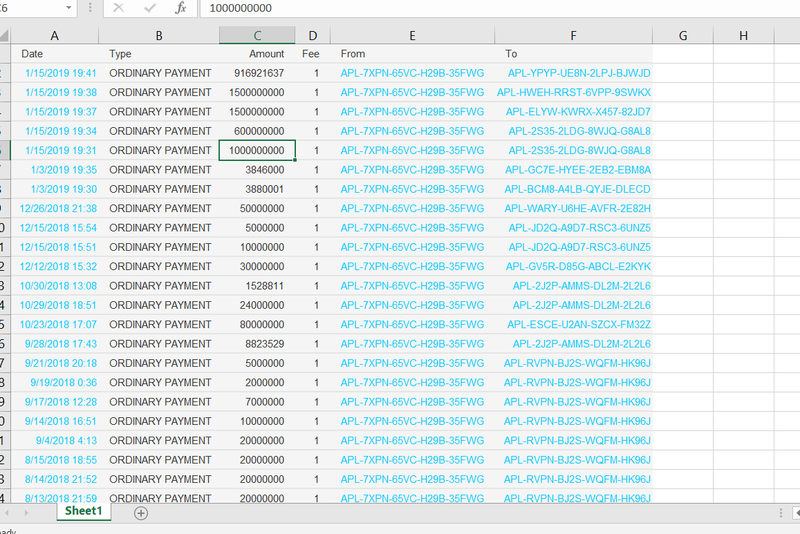 The first wallet address (APL-HWEH-RRST-6VPP-9SWKX) contained 15,000,000,000 $APL coins. To simplify, there are 15 billion $APL coins in this wallet. Therefore, this would technically fit. However, this is an amount that is in dramatic excess (exactly 10x) of what Steve McCullah reported should be in the wallet (no more than 1.5 billion $APL tokens) during our conversation with one another. Since this number is only one decimal place from the number that Steve McCullah gave, we entertained the possibility that I read the number wrong. This proved not to be the case. 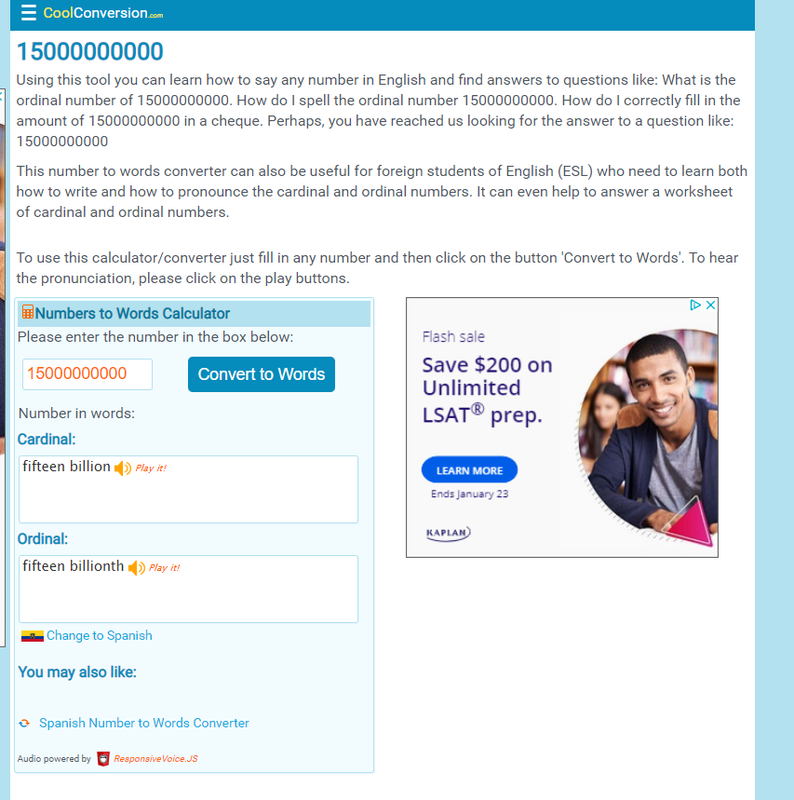 I was able to confirm that my reading of the number wasn’t wrong by copying and pasting it directly from the website into ‘coolconversion’, which is a site that takes any number and converts it into words. I even went directly to Apollo’s wallet website (apollowallet.org) at the behest of Steve McCullah to see if something different would come up. Using the original Foundation wallet address (APL-7XPN-65VC-H29B-35FWG) given to me by Steve McCullah, I was able to confirm the numbers in each wallet address. Upon careful scrutiny, it appears that this indeed was the case. 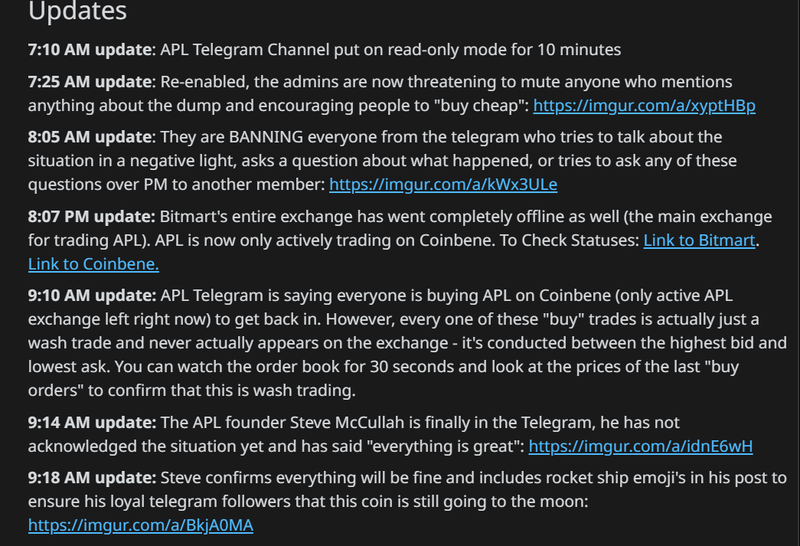 Given all of the information revealed above, it is fair to state that the Reddit post is incorrect in its assertion that the team/developers have or had dumped their entire share of $APL coins on the general public. In fact, this is grossly inaccurate and this is corroborated by the blockchain itself (as well as its API data, which can be pulled; $APL is not private on the API level yet). This was confirmed by joint research conducted by myself as well as Andre Cronje. This is not to say that the Apollo team has not warranted some deserved criticism for admins encouraging speculative purchasing of the currency or their affiliation with John McAfee, whom regularly boasts about their criminal activities, including usurping the American authorities via tax evasion (which is a felony). All criticism aside, one must remember that it is not fair or accurate to call Apollo Currency a scam at this point in time. It is also not fair or accurate to suggest that the founders/developers have dumped the token when, in fact, they have not. If one disagrees with the way that the Apollo team/community is run, that is fair. But that should not be used as a launchpad to make accusations against a team that are not supported by evidence.